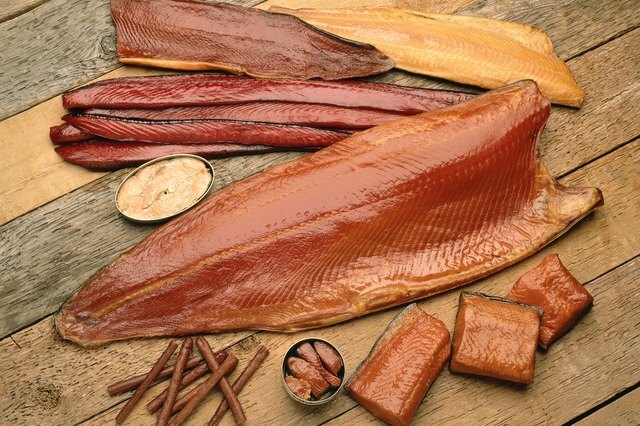 Smoked fish works well as an appetizer or a meal. 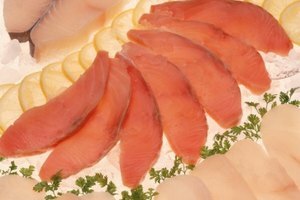 Salmon and trout are perennial favorites for use in the hot smoking process because of their high oil, or fat, content. 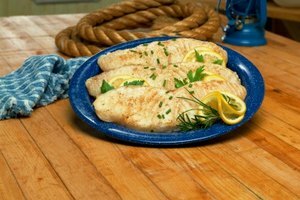 Smoke evenly penetrates high-fat fish so they absorb more smoke flavor and are not as likely to dry out as leaner fish. But all fish can be smoked. Commercially made fish smokers are available, but not necessary. Smoke your own fresh fish using a simple charcoal barbecue grill. Soak hardwood chips in tap water until they are fully saturated. Use woods such as hickory, oak, apple, maple, beech, birch, alder or ash. Hardwoods burn for a long time and give good color and taste to the fish. Put two cups of Kosher or sea salt, two cups of dark brown sugar and one gallon of water into a large plastic or glass container. Stir the brine until the salt and brown sugar completely dissolve, then add any additional desired spices such as bay leaves, seafood seasoning, fresh garlic or black pepper. Use one gallon of brine for every four pounds of fish. Place the fish fillets in the brine and soak them overnight. Cover the container and place them in the refrigerator. Leave enough room in the container for the brine to circulate through and around the fish pieces. Drain the brine from the fish fillets and pat them dry with paper towels. Set them aside while you prepare the charcoal grill. Put charcoal briquettes in the barbecue grill and ignite them, following the manufacturer's instructions. 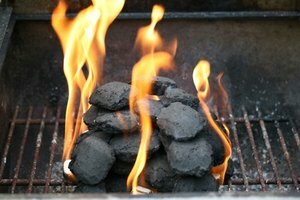 Let the briquettes burn down to a low heat and push them to one side of the grill. 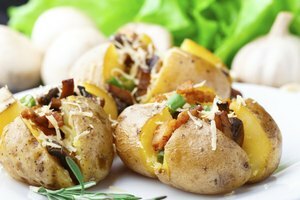 Cover the hot briquettes with wet hardwood chips. Brush the grilling rack with canola oil and replace it in the grill over the briquettes and chips. Keep the briquettes covered with wet chips during the process. Adjust the air flow holes on the top of the grill cover to maintain a constant smoldering low temperature and prevent flames. Lay the fish on the grilling rack about 6 inches from the briquettes, skin side down. 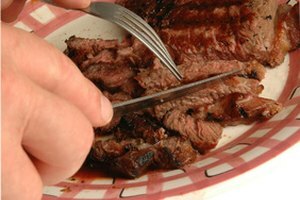 Place an oven thermometer inside the back center of the grill. Brush the tops of the fish fillets with a generous coating of oil. Place the lid on the grill and allow the fish to sit in the smoke for 90 minutes at 175-degrees Fahrenheit, or until the fillets are an even brown color. Lift the lid every 30 minutes and baste the fish with oil to prevent the fish from drying out. The amount of hardwood chips and charcoal needed will depend on the size of your barbecue grill. Add moist hardwood sawdust on the top of the briquettes and hardwood chips throughout the smoking process if you want a heavier smoke flavor. Dried corn cobs can be substituted for hard wood. The smoke from the corn adds a sweetness to the fish.